Welcome to the Rhode Island Chapter! 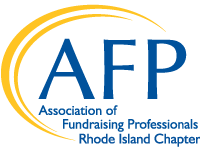 The Association of Fundraising Professionals Rhode Island Chapter (AFP-RI) is dedicated to improving the skills of fundraising professionals, increasing the participation of members and non-members alike in chapter activities and expanding our professional and career opportunities to embrace the diversity of our communities. MISSION: The Association of Fundraising Professionals (AFP) empowers individuals and organizations to practice ethical fundraising through professional education, networking, research and advocacy. Strong RI presence at AFP ICON!